Posted by Madeline Patton on September 16th, 2013 at 4:00am . 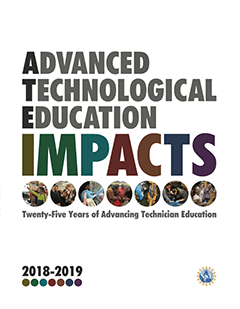 Since it was funded in 2004 as an ATE regional center, the Convergence Technology Center (CTC) has used a Business and Industry Leadership Team (BILT) to identify new technologies and economic trends that influence what technicians need to know. Ann Beheler, executive director of Emerging Technology Grants at Collin College, calls the BILT process the "secret sauce" of CTC's up-to-date curriculum and faculty development programs. "That is integral," she said. "If you pick one thing that absolutely has to be there to keep up with curriculum that changes as much as our does, the BILT leadership has to be there." The CTC's BILT has taken on a national flavor since 2012, when it received funding as a national Advanced Technological Education center. That same year, Collin College in Frisco, Texas, where CTC is based, received a $19.9 million Department of Labor grant for the National Information, Security, and Geospatial Technologies Consortium (NISGTC). The large Department of Labor grant program is known as TAACCCT for Trade Adjustment Assistance Community College and Career Training. The NISGTC Consortium extends the work of CTC and three other ATE centers: the National Resource Center for Systems Security and Information Assurance (CSSIA), the National Center for Geospatial Technology Center of Excellence (GeoTech Center), and Boston Area Advanced Technological Education Connections (BATEC). In the photo from CTC's 2013 BILT meeting, Matt Glover, the senior director of information technology at AMX, stressed the importance of specific technology skills and where they fit in the curricula and degree plans of CTC-affiliated colleges. He talked about stackable certificates and his hope that students' education paths lead to four-year degrees. He listed a good work ethic, amiable personality, passion for work and learning , and pride in performance as key attributes for new hires. CTC asks its BILT members to meet face-to-face annually and via teleconferences quarterly to provide input on technology trends. At the face-to-face meeting, the business and industry representatives, who are sometimes technicians, are asked to rank in importance an extensive list of knowledge, skills, and abilities. BILT members consider the complexity of tasks and how much time it will take entry-level technicians to do them. They add emerging technology skills, and remove those that are no longer needed. The knowledge, skills, and abilities deemed most important by the BILT ranking are then shared with instructors at the 32 colleges in CTC's network. Faculty cross reference the list with their existing courses. Topics not covered in existing courses become the subject of instructional modules that CTC develops and disseminates for use with students. These topics and curriculum for software updates are also covered in CTC's faculty development program known as Working Connections. Working Connections was established in 1997 with support from the American Association of Community Colleges and Microsoft Corporation to build long-term programs in information technology. CTC focuses on keeping instructors well-informed about the technologies that encompass voice, data, video, and image communications transmitted over the same network. Convergence technology programs prepare students for an array of information technology careers, including network administration, network installation, help desk troubleshooting, and cybersecurity. The seven colleges participating in the Department of Labor NISGTC Consortium also participate in four national BILTs for their particular technologies. These BILTs focus on cybersecurity, programming, networking, and geospatial technologies. About 60 business and industry people currently serve on the combined BILT that informs both the CTC network colleges and NISGTC Consortium colleges regarding networking and convergence technologies. The BILTs for the three other technology areas are of similar size. Beheler, the principal investigator of both the CTC National Center and the NISGTC Consortium, explains the overlap of the two federal grants: "We had good things going in ATE and we've now disseminated them out to the colleges in our Department of Labor NISGTC Consortium and to the 32 colleges participating in the network for our national CTC."